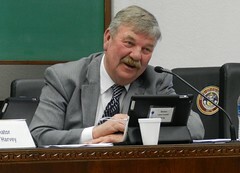 Senator Larry Crowder represents the citizens of Senate District 35 in Southern Colorado. His district includes rural Pueblo County, Alamosa, Baca, Bent, Conejos, Costilla, Crowley, Custer, Huerfano, Kiowa, Las Animas, Mineral, Otero, Prowers, Rio Grande and Saguache Counties. Senator Crowder is an Army veteran, small business owner, farmer and rancher. He is active in his community and formerly served as the Veterans Service Officer of Rio Grande County. Senator Crowder is dedicated to expanding access to quality, affordable health care, as well as promoting job creation and retention in Southern Colorado. Senator Crowder is a fierce supporter of veterans and our brave men and women in uniform. Senator Crowder will continue to fight to ensure that the members of our military and their families are given the assistance they need and feel welcomed when they return home. Larry and his wife Cheri have two sons and four grandchildren. The Crowders work and reside in Alamosa County.